(A sermon on John 4) It is January 1998. I am at camp for the annual camp staff holiday gathering. I have come here early because I need to pray. I need answers, I need comfort, I need direction. You see, 1997 was a really, really bad year. To begin with, my college is not the right fit for me, and I did not transition well to being the small actress fish in a large theatre pond. I am on the wrong path and it’s eating me up inside. My life (as I knew it) got exponentially worse this past March. I came home for spring break and learned that my grandfather was going to die that week. I spent the rest of the semester in a fog of partying and self-pity. I’m a little too good at self-pity. That summer was supposed to make it all better – I was heading back to camp. I have been going to this camp since I was 10 years old. Camp nurtures my faith and fed my soul. The people there are family. I thought I was going to go to camp and sing songs and do candlelight worship and be around my friends and everything was going to get better. We arrived to a new director, which was really exciting because our previous director had been… misunderstood (and we thought kind of mean). In our first all-staff meeting there were at least twice as many staffers, which seemed really weird. We gathered for our first session and were told that the day camp and residential camps were combining. We were all going to spend half of the summer doing day camp around Ohio, living in strangers homes, away from Camp. This is not what I signed up for. This is not why I came to this place year after year. As training wore on, we learned how different things would be. What was supposed to be my safe place became my nightmare. My already fragile health was falling apart due to the constant moving and eating at the mercy of host families and kind church ladies. One day, I was crying as I walked down a path at camp. I was sick, I was tired, I was upset. I looked up and saw the director. I tried to talk to her to see if maybe something could be changed. She looked me in the eyes and asked, “Did you follow your chain of command?” I wanted to ask, “What is this, the army?” Instead, I dissolved into a puddle of tears. The director walked away, leaving me to shake and cry. I was not the only one struggling. That summer was so bad many of my friends would never work there again. I went back to school that fall in worse shape than I had been when I left. I kept partying, I slept through exams, I gave a presentation on Ionesco’s Rhinoceros still drunk from the night before. I stranded friends on a lighting practical that I slept through. The only reason I wasn’t failing was a combination of the grace of God and my professors. Something needs to change. I am on a road to destruction. I want to drop out of school, find the right place to be, but I’m terrified of what my parents would say and of making the wrong decision. So, here I am at camp, ready to pray and get answers. First stop: the chapel in the woods. I drive up to Intermediate Hill and hop out of my car. It is so quiet. I love the silence of snow. My feet squeak as I walk across the chapel field. The chapel is so beautiful in its winter stillness. The altar and chapel benches are covered in snow. I brush a bench off and sit. I stay for a while, talking to God, waiting for a response. Nothing. It’s really cold out — I’m running out of body heat and patience. This isn’t working, but I need answers. I need God. Maybe I need to really get down and touch the earth. I head to the chapel field, get down on my hands and knees and beg God for an answer, a solution, a sign. “Dear God, if I should drop out of school, send me a sign. Make a bunny run across the field, then I’ll know what to do.” No bunny. No nothing. Just silence. I’m shivering now, and it’s almost time for dinner. So… thanks, God? Is your silence an answer? I meander down to the dining hall. There aren’t a ton of people here, largely due to the events of the summer, but it is so good to see the people who are here. To get hugs. To be loved. We eat together, we hang out for a bit, then we head to the lodge for worship. I love taking communion with these people, with my family. I’m trying to ignore the fact that the director is here. But now that it is time to worship, I can’t avoid her. She will be preaching and presiding. I’m sick at the fact that I have to be in the same room with her, much less the fact that I have to listen to her speak for 15 minutes. Her continued presence in this sacred space fills me with rage. I try to practice forgiveness, but it’s too hard. I breathe. We sing, and it is wonderful. We pray and I am at home. We start the readings and I become aware of her again. Aware of the woman who ruined my camp for me and so many people I love. Her sermon begins. I so know what she is talking about. What the what? Tears are streaming down my face. I feel my friend Don’s hand on my back, my friend Jenny sneaks her arm around me. These words feel like they are just for me, straight from God. Straight to my heart from a woman I despise. A woman who ruined something I hold so dear. The answer to my prayer came through her – unexpected, unwanted, frankly — these words came from a place I never would have suspected. I was so, so thirsty for the water of life – and there it was. Here is my foe, offering me exactly what I need. I never saw it coming. I had looked in fields and at crosses, in churches and in the form of fuzzy bunny rabbits. Never in the form of a woman I considered my enemy. 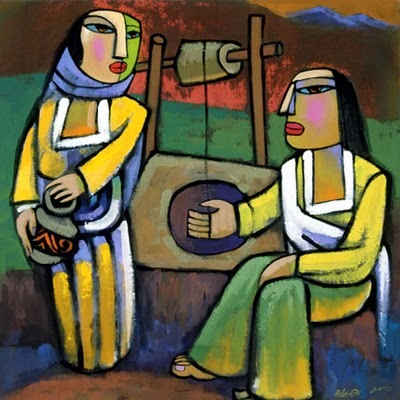 So it is with the woman who went to the well to draw water. She had had a hard life, at least as far as love goes. In my experience, people who are looking for love in all the wrong places are usually looking for the kind of love that won’t be found in another human. They are looking for a love that is wholly different; they are looking to never thirst again — they are looking for the water of life This Samaritan woman went to the well to draw water, as she did every day. She wasn’t expecting to have a conversation with a Jew, and she certainly wasn’t expecting that Jew to know her past or to offer her living water. But that’s how it happened. The people hearing this story about Jesus had expectations. When a man and a woman meet at a well, the story ends in marriage. But Jesus goes and turns this story upside down. That is how it always seems to happen with Jesus. In this way, Jesus is a parable. Jesus meets us in strange and unexpected ways; he makes us tilt our head and try for a new vantage point, he confuses us, he disturbs us, he makes us think about things differently. Jesus meets us where we never expect, in people we would rather not pay attention to. Jesus rarely shows us the answers exactly how we want him to, when we want him to, saying the things we want to hear. Sure, Jesus is here to comfort us and walk with us and love us, but there’s more to it than that – that wouldn’t be a parable. And here’s the thing: we, too, are called to be parables. As much as we are called to comfort, we are called to disturb. As much as we are called to show up where it is expected, we are called to be in places that are entirely unexpected. We are called to reach across boundaries of race and class and gender and orientation and nationality and any other boundaries people insist on creating. We are called to make people shift their view of reality and, in doing so, to point people towards God. This is our call: to live parabolically, as Jesus lived. Go forth and live the parable.